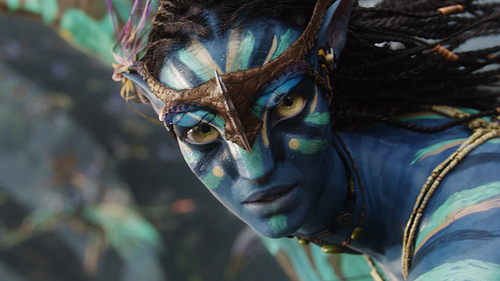 This clip of protesters in Bil'in, Palestine dressed as Na'vi from James Cameron's Avatar circulated widely across the internet this week, and that, paired with the recent announcement that Avatar is nominated for 9 Oscars, made me feel that it was about time to present a round-up of the more thoughtful articles I've collected on Avatar. Feel free to post links in the comments section - I'm hoping this post can become a resource for those who might be interested in additional reading concerning the film. By coincidence, I began reading Greil Marcus’s Invisible Republic, which in part is about the demise of the 1960s folk movement and Bob Dylan’s role in destroying it after having come to exemplify it. The folkies, in Marcus’s depiction, had the same patronizing attitude toward Appalachian poverty and civil-rights injustices (the Other America, as Michael Harrington dubbed it) that the makers of Avatar seem to evince about colonization. Capitalism sullied and exploited the pure rural people, as clear-headed bourgeois liberals can best recognize. To adherents, folk music (and Avatar) offers us glimpses of pre-capitalist America, a “democratic oasis unsullied by commerce or greed” in which art seems “the product of no ego but of the inherent genius of a people.” The Avatar planet is such a product, for the race occupying it and the film-industry execs who made it. The substance of this fantasy about indigenous people at harmony with their appropriate environment is the denial of individual subjectivity (the overriding value of the folk revival, according to Marcus), which is rendered unnecessary and impossible. Everyone is at one and merged with one another. Just look at the blue people in the movie sway to the unsounded rhythm as they worship their special tree. Marcus: “As they live in an organic community ... any song belongs to all and none belongs to anyone in particular.” This is an attractive fantasy to have about other people, as it leaves oneself as the last unique individual standing—like the hero of Avatar. Folk music tends to make a virtue out of a subject people’s lack of autonomy because its adherents can’t see a way to ameliorate those people’s powerlessness without surrendering some of their own comfort. Avatar offers a fantasy solution, in which one vicariously becomes one of the subject people without losing one’s distinctive identity, and then helps that group achieve autonomy. The story conveniently ends there, before the logic of communal unity eradicates the hero’s sense of self. With its floating Roger Deanscapes and hallucinogenic flora, the manifest world of Avatar instead spoke another truth: that the jungle pantheism that now pervades the psychoactive counterculture has gone thoroughly mainstream. Of course, noble savage narratives of ecological balance and shamanic wisdom have been haunting the Rousseau-mapped outback of the western mind for centuries. That said, Avatar represents some important twists in that basic tale. The most important of these is that the Na’vi’s nearly telepathic understanding of their environment is grounded not only in ritual, plant-lore, and that earnest seriousness that now afflicts PC Hollywood Indians, but in an organic communications network: the fibrous, animated, and vaguely repulsive pony-tail tentacles that not only allow the Na’vi to form direct control links with animals but also, through the optical filaments of the “Tree of Souls,” to commune with both ancestors and the Eywa, the biological spirit of the planet whose name resonates with Erda, our own Earth. Call it ayahuasca lite. For while Avatar features nothing like the South American shaman lore and stupendous aya visuals that litter the otherwise very bad 2004 Western released here as Renegade, the film does suggest that the bitter jungle brew, and ideas of ecological wisdom now attached to it, is having a trickle-down effect. The banisteriopsis caapi vine that gives ayahuasca its name (though not its most hallucinogenic alkaloids) is also known as the “Vine of Souls,” which echoes the Na’vi’s Tree of Souls. And when Sigourney Weaver attempts to establish the efficacy of the Trees through a neurological discourse of electrical connection, the corporate tool Parker asks what she’s been smoking—a backhanded way of acknowledging how much Avatar’s visionary take on ecological consciousness is grounded in psychoactive consciousness. In the beginning, there's a lot that goes on. Even though it's, in a sense, scientific mumbo jumbo. But you begin to understand the rules. By the end, you can just flip back and forth and see the cause and effect. You understand where you are in those two dimensions. And there's something about the fact that that's what's happening in form: going from Kansas to Oz, and deeper into the levels of Oz, all the way to this phantasmagoric state. But also, remember that that's the content of the movie, because the avatar itself is a hybrid. That state is a hybrid state of being part human and part this other. Whether Avatar is racist is a matter for debate. Regardless of where you come down on that question, it's undeniable that the film - like alien apartheid flick District 9, released earlier this year - is emphatically a fantasy about race. Specifically, it's a fantasy about race told from the point of view of white people. Avatar and scifi films like it give us the opportunity to answer the question: What do white people fantasize about when they fantasize about racial identity? Why does the digital nativity bother me so much? I think the answer has something to do with the smug anti-corporate plot. In reality-in the reality outside the movie—the Na'vi, too, are a product of corporate America and are creatures of technology, not nature. Now there's nothing wrong with technology per se, and there's nothing wrong with fantasy, either. But Avatar claims that there is something wrong with technology, and that the Na'vi of Pandora somehow represent opposition to it. That's rank mystification, and one has to wonder about motive. Avatar could be thought of as the first mega-blockbuster that's fully broadband. Its hero is literally an avatar, the virtual representation of a live human being who manipulates its adventures remotely, like the player of a video game. (The original Sanskrit meaning of "avatar"—the bodily form taken by a deity descending to earth—is also suggested in this movie's quasi-religious cosmology.) Far from the millennial bleakness of The Matrix, Avatar is an end-of-the-world fantasy that's sanguine about the prospects for virtual reality.